Mobile service operators enjoyed 24% jump in data revenue in fiscal year 2013-14 ended in June. Meanwhile, Pakistanis signed up for 3G and 4G mobile broadband services at a rate of one million per month over the last five months. The data revenues of mobile phone service operators reached Rs. 47 billion during the year under review, 47.4% year-over-year growth. “This is a healthy sign in the wake of 3G and 4G services in the country and shows that the use of internet and data services on the cellular mobile has been increasing,” according to a recent Pakistan Telecommunications Authority (PTA) report. The increased use of social media messaging apps negatively impacted text messaging growth as the SMS volume declined to 301.7 billion during FY2014, down 4% compared to 315.7 billion in 2013. The average monthly SMS per subscriber volume was down to 180 in FY14 compared to 214 of FY13. PTA reported that each cellular subscriber in the country has 2.17 SIMs on average, which translates to an actual monthly ARPU (per user revenue) of Rs 432. Mobile broadband roll-out and double-digit growth in data revenue are expected to enable a whole new Internet-based economy with growth of mobile apps from social media, education, health care, entertainment, financial services and e-commerce to government services in Pakistan. Pakistan ended January with over 9.07 million 3G/4G subscribers, up from 5.71 million in December 2014, according to data from Pakistan Telecommunications Authority (PTA). Telenor led the 3G/4G market with over 2.25 million subscribers, followed by Ufone (2.25 million 3G/4G subscribers), Mobilink (2.17 million 3G/4G subscribers), and CMPak (1.85 million 3G subscribers and 5,023 4G customers) Warid had 44,075 LTE network subscribers at 31 January 2015. There are many problems with the current situation. In simpler words, there are bands (frequencies) for 3G and 4G technologies — just like radio frequencies — and operators in Pakistan operate their 3G networks in 2100Mhz band only. Now 3G smartphones that doesn’t offer 3G network compatibility in 2100 band will simply not work in Pakistan. When you buy Redmi or others make sure the band is correct. We are seeing many problems. Pakistan Telecommunication Company Limited (PTCL), Pakistan s largest telecommunication services provider, has inked an agreement with Soneri Bank to provide Data Center hosting services. PTCL Data Center, the only certified Tier 3 Data Center in Pakistan, will serve Soneri Bank s integrated branch banking operations spanning over 250 branches. Kamal Ahmed, Chief Digital Services Officer, PTCL said at the occasion We are pleased to extend cooperation to Soneri Bank to provide better services to its customers. PTCL business solutions are designed to enable growth and the company is striving to empower organizations and improve efficiencies through its endtoend ICT solutions. Our stateoftheart Data Centers offer optimum network security and profitability, thus helping organizations to move up the value chain, added Kamal Ahmed. Muhammad Aftab Manzoor, President & CEO, Soneri Bank said at the occasion, The synergy of PTCL with Soneri Bank is a welcomed combination to achieve our goal to deliver exceptional client experiences through improved operational efficiency. Senior management from both the organizations including Kamal Ahmed, Chief Digital Services Officer, PTCL; M. Aftab Manzoor, President & CEO, Soneri Bank; Amin A. Feerasta, Chief Risk Officer, Soneri Bank; Ahmed Saqib Asad, Chief Information Officer, Soneri Bank; Noman Muzaffar, Head Infrastructure Services, Soneri Bank and Mirza Sajid Baig, General Manager Corporate Services, PTCL were present at the occasion. PTCL is the leader in the corporate digital services that provide large networkbased organizations with greater efficiency through its seamless ICT services. Pakistan has imported record US$ 544 million of cellular mobile handsets and US$ 682 million worth of telecom equipment during last one year, registering 20.7 percent and 30.3 percent increase respectively. During the year, both operators as well as cellular mobile customers prepared themselves for 3G and 4G services. The operators upgraded their telecom networks and systems while subscribers opted to shift to smartphones to enjoy such services. According to latest telecom stats, overall, the telecom imports crossed the mark of US$ 1.23 billion, of which 44.4 percent was for imports of consumer items i.e. cellular mobile handsets. The telecom experts on Tuesday said there is a dire need for deployment of local manufacturing plant to reduce import bill. It is now vital to develop local industry for telecom equipments and handsets with cooperation of regional partners engaged in telecom manufacturing. Telecom service provider Telenor Pakistan has achieved 2.6 million 3G subscribers in 73 cities. The company has launched 3G services in Pabbi, Karak, Sheikhupura, Toba Tek Singh, Lakki Marwat, Mianwali, Khyber Agency and Vihari during the current phase of commercial rollout. Telenor Pakistan will offer free trial of 3G services — 50 MBs of free data every day — to customers in these newly added areas for two weeks. The company will be charging 2G data services as usual. Telenor Pakistan is following a two-fold strategy to roll out 3G sites across the country. First, the telecom operator will increase the number of 3G sites within a city thus expanding the in-city coverage. Second, it will increase the number of 3G cities across the country. “We will strengthen network reach and stay committed towards building an ecosystem to further facilitate 3G growth in the country,” said Irfan Wahab Khan, chief marketing officer, Telenor Pakistan. In 2013, Telenor Pakistan invested substantially in modernizing its telecom network including base station equipment, value-added service platforms, among other things. Telenor Pakistan selected telecom equipments which are 24 percent more energy efficient and possessed intelligent power management features with reduced power consumption. While the two-year delay in bringing 3G to Pakistan (the date was initially set to be in 2012), helped MNOs build momentum for this next generation mobile technology, increasing smartphone penetration is the most essential component in driving 3G and 4G adoption. Those MNOs which are able to increase smartphone penetration on their networks will enjoy better 3G network ROI in the long run. Established players like QMobile need to look into the possibility of going beyond Android devices and moving into the Windows platform as well. Apple will be coming to Pakistan with a complete after- sales service support structure. This is the ideal time for Apple to make an official entry given that 92% of the market is still on 2G despite the fact that five MNOs are now offering high speed internet services. According to market intelligence, Apple has signed up local distributors and the next step might be for the company to adopt an operator led distribution model. Samsung enjoys the largest share in the $150 plus handset category and the company is looking at making ecommerce an active channel (an indication is its recent partnership with Daraz, whereby the website is Samsung’s official online retail partner). Given that Apple is not active in the $300 to $500 category, Samsung will continue to enjoy supremacy in this category. The battle between Samsung and Apple will be in the $500+ category. Huawei has taken the 3G challenge head-on. The company has shut down 2G feature phone manufacturing and is concentrating on developing 3G enabled devices. As a result, Huawei has increased its media spend in 2014 (which had so far been limited to trade marketing) and is strengthening its distributor network. In terms of new entrants, the most prominent is Lenovo. A huge name in laptops, Lenovo’s smartphones have been backed by favourable product reviews internationally. In order to have a strong market entry, the company’s first move was to hire Arif Shafique, one of the top people from Nokia for its device business. In line with its global strategy, Microsoft is in the process of consolidating by focusing on Windows-based Lumia devices. In the light of past experience, Microsoft will be very aggressive in terms of leveraging partnerships with device manufacturers, telecom operators and app developers. Here are some of the opportunities that device manufacturers will be leveraging, either on their own or in partnership with other industry players. Device theft and loss coverage will become a highly attractive new sales proposition, although if theft validation is not handled properly, there is a huge probability of fraudulent claims. The launch of instalment based smartphone/data bundled plans either via financial institutions or with MNO support. MNO led low-end 3G devices and device data bundled propositions will continue. Device manufacturers will use their strong footprint of experience centres to facilitate after sales support services. The launch of innovative local apps with R&D support by device manufacturers. Integration of operator billing with device manufacturers’ app stores. As an example, Mobilink has partnered with Nokia and Android. BARCELONA: In a significant development for the telecommunication sector in the country, Pakistan was awarded the “Spectrum for Mobile Broadband Award 2015” at the Mobile World Congress 2015 of the GSM Association held in Barcelona, Spain. Pakistan was awarded for successfully auctioning spectrum for 3G/4G services in the 850 MHz, 1800 MHz and 2100 MHz bands in 2014, and thereafter the rapid uptake of 3G services in the country. “The award to Pakistan is an indication of the global community reposing its trust in the telecommunication sector policy practices of the Government of Pakistan,” a statement from the Ministry of State for Information Technology quoted minister Anusha Rehman. The award is one of the two annual mobile excellence awards given as recognition of growth of the mobile industry in the country. ​The minister in her key note address said that in a short span of 6 to 8 months since launch of 3G/4G services in Pakistan, mobile broadband subscriptions for 3G stand at around 10 million. “The Spectrum auction for next generation mobile services has not only enabled the people to gain access to mobile broadband services but has also encouraged investment in mobile networks in Pakistan,” said Rehman. The minister added that the introduction of 3G and 4G services in Pakistan was a step forward towards creating an ‘accelerated digitisation ecosystem’ with special emphasis on ‘Bridging Broadband Divide’. She said the government has accorded the highest priority to the development of Information Communication Technology (ICT) and applications for the provision of quality services, education, employment generation, and women empowerment. Rehman is currently leading a delegation of Pakistan at the annual GSMA Mobile World Congress, being held in Barcelona, Spain. Cellular data consumption — after the auction of 3G/4G spectrum — is witnessing an exponential growth in Pakistan, revealed Dr. Ismail Shah, Chairman PTA, during his keynotes at recently held road-show organized by Nokia Networks. Dr. Ismail Shah revealed that Pakistani mobile phone users consumed a total of 6,840 tera-bytes (TBs) of data during December 2014, up from just 1,243 tera-bytes (TBs) during January 2014 showing almost 600% growth in data usage. In April 2014, Islamabad took a giant leap forward by auctioning the mobile spectrum for third-generation (3G) and 4G technologies. 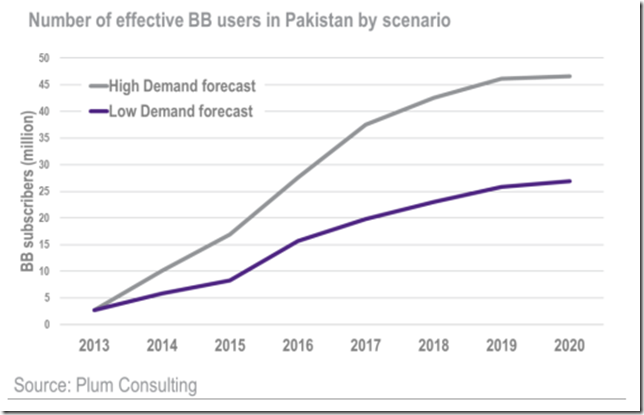 This April, the country’s telecom market went through another major breakthrough that is likely to spur the growth of mobile broadband across Pakistan. The breakthrough under discussion is the recent deal between Warid Telecom and Towershare – a leading operator of wireless communications infrastructure with focus on Middle East North Africa and South Asia region. Under the deal, Towershare will acquire 4,500 base transceiver station (BTS) towers, commonly known as mobile towers, of Warid Telecom, Propakistani reported earlier this month. Shortly after that, Toweshare, which buys, builds, maintains and operates telecom tower infrastructures, entered into another agreement with Ufone to help the latter expand its coverage to remote areas of the country. Under the agreement, Towershare will rent spaces to Ufone on cell sites that they will build. The Dubai-based telecom towers company, according to market talk, will be signing an agreement with all five operators, which is likely to trigger the growth of mobile penetration – especially broadband. In the past, telecom operators in Pakistan have tried to build mobile towers themselves, but it has not worked because of the huge costs attached to the rollout and maintenance of these mobile towers. Even globally, it is always independent tower companies that eventually buy telecom towers. Towershare’s entry in the Pakistani market and aggressive expansion plans are therefore very beneficial for both the industry and consumers because of the advantages attached to infrastructure sharing. With an independent company taking care of the critical infrastructure, the cellular service providers can focus on other aspects of business and cut their expenses – that is the operators can save on high capital and operational expenditures associated with maintenance of mobile towers. Tower sharing will also help service providers enter underserved areas of the country by setting up connectivity with mobile towers built by a third party. Moreover, tower sharing will reduce the environmental impact of network expansion, which means only one mobile tower can be shared by all operators eliminating the need for having five different towers, minimising the visual impact of towers in surrounding areas. It will also help reduce power consumption in terms of fuel and generators required to sustain independent dedicated networks. The tower-sharing model, according to sources, has the potential to reduce 200MW of power requirements of Pakistan – enough to power multiple industrial complexes. In short, tower sharing helps reduce the cost of providing services to remote or difficult areas, ensuring that millions of people get the services that are otherwise not available. For a country like Pakistan, this is a welcome development for it will help expedite the growth of mobile network to far flung areas – one aspect that the country has been lacking. Despite its robust and investment friendly regulatory environment, the country’s broadband penetration remains under 10% or 12 million as of March, 2015. With Towershare taking responsibility of building new cell sites, the network expansion will be swift because all the operators will need to do is to share space on rental basis, not to mention the foreign direct investment the country will attract towards infrastructure development – the company has already pledged an investment of $400 million towards building new towers, according to sources familiar with the matter. Telecom sector revenues are likely to touch Rs 600 billion in the current financial year 2014-15 with the tremendous surge in consumption of telephony services and 3G/4G technology by customers, including significant savings of the companies on account of operational expenditures. Economic Survey of Pakistan for 2014-15 revealed that revenues of the telecom sector increased to Rs 299 billion in the first half from July to December 2014. This is first time the sector recorded handsome values of earning historically. The estimated revenues growth is likely in between Rs 580 billion and Rs 600 billion, which will be more than Rs100 billion from the previous fiscal year of 2013-14, which posted the revenue growth of Rs 465.5 billion. In 2012-13, the telecom sector posted a growth of Rs 439.5 billion and Rs 409.2 billion in 2011-12, respectively. On the account of savings of cellular phone sector, their operational cost reduced significantly, as similar to multiple service sectors, including decline in petroleum prices, reduce electricity tariff and Rupee appreciation against Dollar. Oil prices went down to 34.6 percent from October 2014 to February 2015. The petrol prices go down to around Rs 70.29 per litre from Rs 103.62 per litre whereas diesel prices also declined to Rs 80.61 per liter from Rs 108.34 per litre. Petrol and diesel are mainly used by the telecom for purpose of transportation of infrastructure, backup fuel supplies to power generators to BTS (cellular sites). The electricity is the major head of operational expenditure of cellular phone companies which reduced drastically in the past six months subsequently the prices of electricity went down on the lower prices of furnace oil. For instance, power tariff of all distribution companies were reduced twice by Rs 4.43 per unit and Rs 3.24 per unit in April and February during the period of last six months. Similarly, the power tariff decreased in the city of biggest subscribers base Karachi for customers including commercial sector slashed by Rs7.40 per unit from April 2014 to February 2015 whereas it further reduced the tariff by Rs 1.74 per unit under the head of fuel adjustment. The survey commented that the availability of 3G and 4G services has enabled development of new applications and data base services, and people of Pakistan are quickly adopting to these new technologies and services. This has resulted in surge in data revenues of cellular mobile industry, reaching Rs. 37.3 billion during July-December, 2014 compared to Rs. 22.1 billion in July-December, 2013, showing an increase of 69 percent. The Survey forecasted that revenues are expected to further increase in the coming years as more subscribers are added into the 3G and 4G LTE fraternity, generating more data revenues of telecom industry. Shipments of smartphones in Pakistan increased by a massive 124% year on year during the first quarter of 2015, with shipments up 21% when compared with the previous three month period. That's according to the latest findings from global technology research and consulting firm International Data Corporation (IDC), which attributes the shifting dynamics of the Pakistan mobile market to the deployment of 3G 4G networks across the country and the subsequent rise in demand for devices that are compatible with the new infrastructure. Pakistan has traditionally been a feature phone market indeed, just three years ago (2012), 93% of all mobile phone shipments in the country were feature phones since there was no network to support smartphones. Even those consumers that did own smartphones had to be content with only using traditional voice and SMS services. In the last year, however, the market has experienced a drastic shift to the smartphone form factor. According to IDC's Global Mobile Phone Tracker published in Q1 2015, smartphones now account for about 30% of all the devices shipped to Pakistan, up from 25.3% in the previous quarter and from 14.7% in the corresponding period last year. This shift is set to continue, as IDC expects the proportion of smartphones to overtake feature phones by the end of 2017. The Shift to Smartphones in Pakistan The rapid shift to smartphones began in 2014 following the deployment of 3G 4G networks in the country. Inevitably, there is now a scrum of vendors trying to get a share of the pie, and as telecom operators deploy infrastructure to the whole country, the level of competition is only expected to increase. Data from the Pakistan Telecommunication Authority (PTA) shows that only about 10% of all subscribers in the country are using 3G 4G networks, so the shift to smartphones will gather even more pace as the numbers of 3G 4G subscribers increase. Another important factor to consider is that mobile phone penetration currently stands at around 75% in Pakistan, meaning there is a sizeable share of the population that has yet to acquire any type of mobile device. Uptake among these first time buyers is sure to spur the smartphone market's development even further. Meanwhile, dual device ownership is expected to rise, with consumers increasingly acquiring a smartphone in addition to their existing feature phones, not only so they can capitalize on the added benefits of smartphone ownership, but also so they can leverage the on net savings that telcos may provide for both voice and data usage. Vendor Specific Trends As the above shift is taking place, the market is witnessing an increase in the number of vendors offering different SKUs of devices. QMobile continues to dominate the market with an overall unit share of 58%, leading in both the feature phone and smartphone segments. Nokia and Voice are the other key players, with shares of 17% and 5%, respectively. The market is also witnessing an influx of new vendors. Despite QMobile's strong lead, IDC expects competition to intensify as other players like Voice, Samsung, Huawei, and Lenovo make inroads into the market. "We expect to see fluctuations in the market's vendor shares as large global players start to establish a stronger foothold in the market and new players try to gain a slice of the action," says Nabila Popal, IDC's research manager for handsets and display solutions in the Middle East and Africa. "Samsung, for example, initially had a hard time in the Pakistan market, but recent changes to its product mix and target price bands have helped it to finally gain traction in the market, recording a 6% share of smartphone shipments in Q1 2015."